Sundance • Documentary tells the unlikely story of secret video that helped girl avert arranged marriage and find home in Utah. 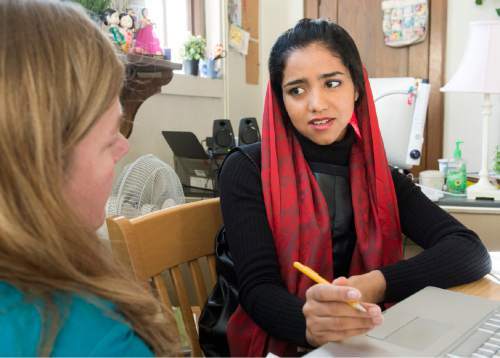 Rick Egan | The Salt Lake Tribune Sonita Alizadeh works on a research project about women's rights in her ESL class at Wasatch Academy in Mount Pleasant . Alizadeh is an Afghani teenager and rap singer who is the subject of a new documentary at Sundance, "Sonita." A scene from the documentary "Sonita," which will be part of the 2016 Sundance Film Festival lineup. 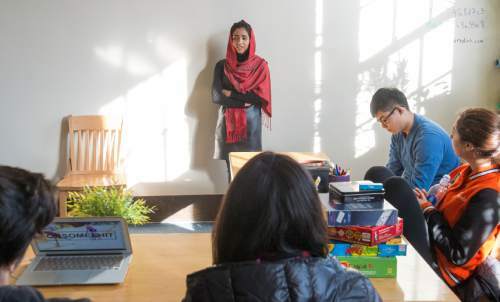 Courtesy Sundance Film Festival Rick Egan | The Salt Lake Tribune Sonita Alizadeh in her English as a Second Language class at Wasatch Academy in Mount Pleasant. 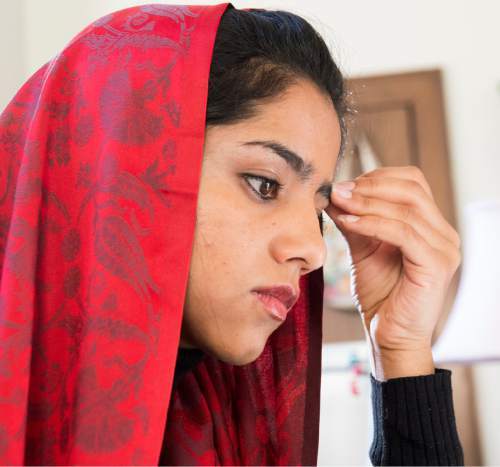 The 18-year-old refugee from Afghanistan earned a scholarship to the central Utah school after she posted "Daughters for Sale," a rap video about that helped to saved her from being sold into an arranged marriage. Rick Egan | The Salt Lake Tribune Sonita Alizadeh receives instructions from teacher Angie Christiansen in her ESL class at Wasatch Academy in Mount Pleasant.. Alizadeh is an Afghani teenager and singer who escaped being sold into an arranged marriage and is the subject of a Sundance Film Festival documentaryl, "Sonita." 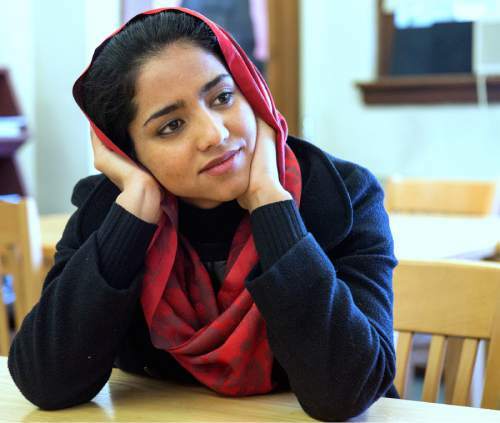 Rick Egan | The Salt Lake Tribune Sonita Alizadeh in class at Wasatch Academy in Mount Pleasant, who is the subject of "Sonita," a documentary screening at the Sundance Film Festival. 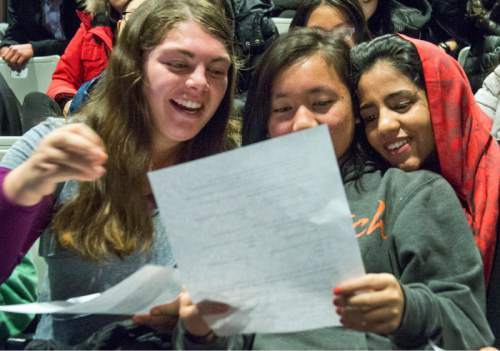 Rick Egan | The Salt Lake Tribune Christina Perea, Keziah Gossid, and Sonita Alizadeh, laugh as they look at a dating survey, at Wasatch Academy in Mount Pleasant, Wednesday, Jan. 13, 2016. Alizadeh is an Afghani singer who has been at Wasatch Academy in Mount Pleasant, for 1 1/2 years. She is the subject of a new documentary at Sundance, "Sonita," Rick Egan | The Salt Lake Tribune Sonita Alizadeh, has a laugh with her friends, at Wasatch Academy in Mount Pleasant, Wednesday, Jan. 13, 2016. Alizadeh is an Afghani singer who has been at Wasatch Academy in Mount Pleasant, for 1 1/2 years. 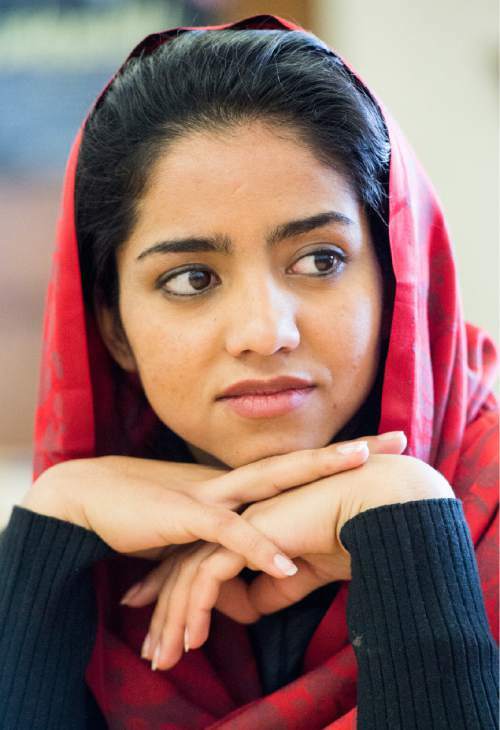 She is the subject of a new documentary at Sundance, "Sonita," Rick Egan | The Salt Lake Tribune Sonita Alizadeh, speaks in her ESL class, about her experiences in her country, at Wasatch Academy in Mount Pleasant, Wednesday, Jan. 13, 2016. Alizadeh is an Afghani singer who has been at Wasatch Academy in Mount Pleasant, for 1 1/2 years. She is the subject of a new documentary at Sundance, "Sonita," Rick Egan | The Salt Lake Tribune Sonita Alizadeh (left) discusses her dreams with Jana Alajbeg from Croatia, and her adviser, English teacher Alyssa Wolf (right) during class at Wasatch Academy in Mount Pleasant. Sonita, an Afghani refugee, is the subject of a new documentary at the Sundance Film Festival. Rick Egan | The Salt Lake Tribune Sonita Alizadeh (left) discusses her dreams with Alyssa Wolf (right) during class at Wasatch Academy in Mount Pleasant, Wednesday, Jan. 13, 2016. Alizadeh is an Afghani singer who has been at Wasatch Academy in Mount Pleasant, for 1 1/2 years. 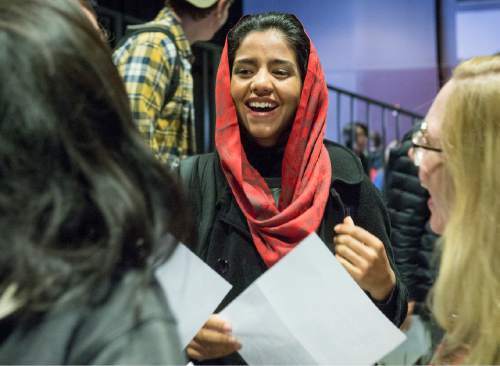 She is the subject of a new documentary at Sundance, "Sonita," Rick Egan | The Salt Lake Tribune Sonita Alizadeh smiles during discussion in class at Wasatch Academy in Mount Pleasant. 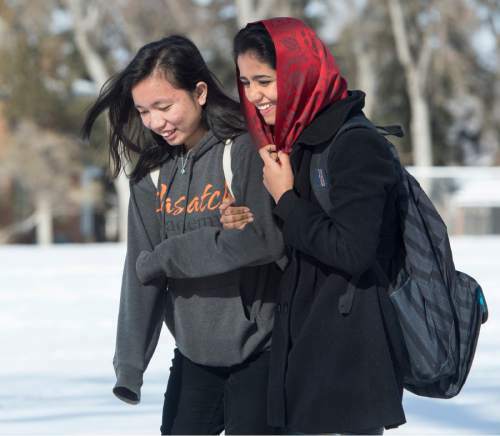 Rick Egan | The Salt Lake Tribune Keziah Gossid and Sonita Alizadeh walk across campus at Wasatch Academy in Mount Pleasant. 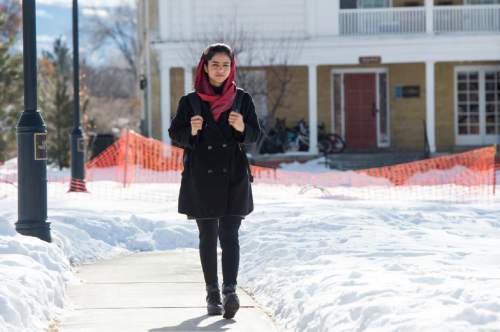 Rick Egan | The Salt Lake Tribune Sonita Alizadeh walks across campus at Wasatch Academy in Mount Pleasant. After escaping an arranged marriage, the Afghani teen landed at the central Utah boarding school in January 2015. At the time she spoke little English. Her story is the focus of "Sonita," a documentary screening at the Sundance Film Festival. Rick Egan | The Salt Lake Tribune Sonita Alizadeh smiles during discussion in class at Wasatch Academy in Mount Pleasant, Wednesday, Jan. 13, 2016. Alizadeh is an Afghani singer who has been at Wasatch Academy in Mount Pleasant, for 1 1/2 years. 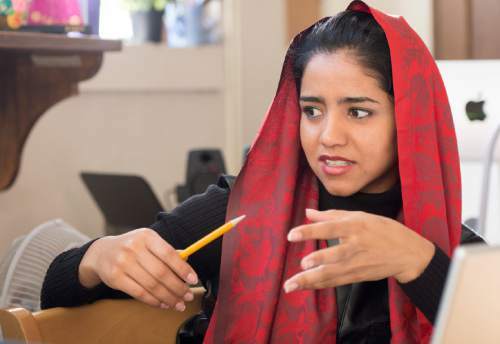 She is the subject of a new documentary at Sundance, "Sonita," Rick Egan | The Salt Lake Tribune Sonita Alizadeh works on a song in the school recording school with Frank Moody, a mentor who teaches technology and media literacy classes at Wasatch Academy. 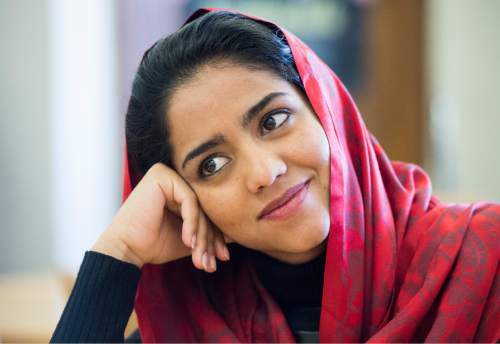 Mount Pleasant • When Sonita Alizadah arrived at Wasatch Academy last January, the Afghani teenager and wannabe rapper knew only two words in English: "hungry" and "thirsty." The irony is that it was the force of Sonita&apos;s words in her Persian rap  her fierce, rapid-fire "Daughters for Sale" music video against selling young girls into arranged marriages  that landed her in this sleepy, picturesque central Utah town. Now a world away from her family who had been negotiating the price on her own headscarf-covered head, Sonita, then 17, was set to begin learning the right words in a new language to save other girls from being sold. All this while she was starting her first round of formal schooling. The story of a secret YouTube rap video that helped a teenager escape an arranged marriage has the ring of a Hollywood fable. Instead, the girl&apos;s life was changed as her story unfolds in Iranian filmmaker Rokhsareh Ghaem Maghami&apos;s quietly intimate documentary, "Sonita," which will screen this week in the World Cinema Documentary competition at the Sundance Film Festival. Meeting Sonita on campus makes it easier to understand what teachers and friends describe as the force of her personality. "She&apos;s humble, but she also just believes you can do anything," says Frank Moody, Wasatch&apos;s technology instructor, who has spent hours in the school&apos;s studio helping record her songs. "Sonita is amazing onstage. She has a natural gift for getting in front of people and lighting up." Soon after she met Moody, whom the school assigned as a mentor, she asked, in her still-emerging English: Would he be the person who would help keep her centered on her agenda? What teenager is wise enough to request that? Moody asks a year later at a time when many of the hopes scribbled in Sonita&apos;s dream journal are coming true. At her core, Sonita is an activist, and rap music is just the vehicle for her message about women&apos;s rights. Says Moody: "You don&apos;t say no to Sonita." &apos;Almost a child bride&apos; • On a January morning, Sonita Alizadah stands in front of her English as a Second Language class to give an assigned presentation, her headscarf red as a stoplight against the classroom&apos;s whiteboard. Born during a war in Afghanistan, she and her family escaped to Iran. But without a birth certificate, Sonita didn&apos;t have access to formal education. She adopted an April 4 birthday and guesses she&apos;s about 18 years old. Students in this Utah classroom already know much of her story after reading about her activism in a national magazine story profiling five teens who are changing the world. "I was almost a child bride," she tells her classmates. "In my country, selling girls is very, very common. People say it&apos;s a tradition, but I disagree with them because it&apos;s against children&apos;s rights, it&apos;s against human rights." She continues: "It happened to me two different times, at 10 and again at 16. The first time, I wasn&apos;t sad because I couldn&apos;t understand what was going on. I thought it was a childish game, but anyway, fortunately, it didn&apos;t happen." Through the songs she had written, she met an Iranian filmmaker. "After a few weeks, she became interested in my life and started following me by camera." What is it like to share your story? a student asks. I want to give hope to other girls, Sonita says. Is it scary? a student asks. "I am happy I can tell my story and tell it to so many people," she says. "And it&apos;s not just my story. There are so many girls in the world who have a story like me, but they&apos;re not as lucky as me. "Fearless" is how Joe Loftin, Wasatch Academy&apos;s headmaster, describes Sonita. "She&apos;s a girl who a year ago didn&apos;t speak English, and now she&apos;s sitting on a stage at an international gathering talking to influential people," Loftin says, referring to media mogul Tina Brown&apos;s Women of the World summit in London last October. In December, she was named to Foreign Policy magazine&apos;s list of 100 Global Thinkers "for refusing to be bought and sold," while the BBC included her as one of its 100 inspirational women. "She just jumped in and took off. Nothing is going to dampen her voice," Loftin says. Even the unlikely fact that Sonita is a scholarship student at this exclusive Utah boarding school is a spoiler for the documentary&apos;s ending. &apos;Will you help me?&apos; • In "Sonita," the camera follows a personable, ambitious refugee teenager as she works cleaning offices and bathrooms, and goofs around rapping with other girls while attending life-skills classes at a Tehran educational nonprofit. With family members, Sonita escaped war in her native Afghanistan at age 8 and still has nightmares about fleeing Taliban soldiers. As a refugee without documentation, she lives in poverty with her sister and niece and dreams of a "shiny life" as a musician, telling a teacher she wishes she were the daughter of Michael Jackson and Rihanna. Ghaem Maghami, the filmmaker, was looking for the subject of her next film when a cousin who worked at the nonprofit told her about a bright young girl who wrote rap songs. "I was thinking the movie would be a sad movie," says the filmmaker, who now splits her time between Tehran and San Francisco. "I wanted to show all the dreams of a teenager who didn&apos;t have an identity." Sonita&apos;s big dreams are threatened when her mother prepares to sell her youngest daughter in an arranged marriage. The family is seeking money so Sonita&apos;s brother can buy a bride. Her mother negotiates the price for Sonita  she&apos;s a good girl worth about $9,000, the mother says  while Ghaem Maghami films the teenager listening in another room. The mother was born and raised in a society where everybody does this. "There was no shame for her," Ghaem Maghami says. Then comes the moment that sets apart the documentary and changes the world for one bright girl. Sonita looks at the camera, and it is as if she is looking ahead to all the film&apos;s future viewers. "Will you help me?" she asks, frankly, directly, as boldly as if she were raised to believe a girl&apos;s life matters. She promises to pay back the filmmaker when her songs make money. From the other side of the camera, Ghaem Maghami says she doesn&apos;t have money, and that it isn&apos;t her job. "I didn&apos;t know what to do," the filmmaker says now in an interview. "She was sure that I wouldn&apos;t let this happen. She knew it before I knew." For documentary storytellers, what happens next is ethically charged, as the filmmaker steps across the line to become a participant in Sonita&apos;s story. "At that moment, it was kind of a risk, but then I was thinking, if I can&apos;t do that, I won&apos;t feel good," Ghaem Maghami says, adding with a wry storyteller&apos;s wit: "Also, I would lose my protagonist." The filmmaker goes on to offer $2,000 to Sonita&apos;s family to put off the marriage and coaches Sonita as the girl writes and records her "Daughters for Sale" video (which is known as "Brides for Sale" in its English translation). The center of everything • The YouTube video begins with a close-up of Sonita&apos;s beseeching eyes, a bar code inked on her forehead. "Let me whisper to you my words, so no one hears that I speak of the selling of girls." It&apos;s a dramatic opening for a dramatic song. With its stark makeup, lighting and costumes, the video employs the tools of contemporary iconography to challenge a generations-old cultural tradition. During the 3½-minute video, the singer&apos;s eyes are darkened with bruises, her cheeks etched with bloody cuts, before she&apos;s enveloped in a white wedding dress and tiara-crowned veil. Throughout, Sonita&apos;s voice is filled with yearning and fierceness. What happens next, after the song is posted on YouTube in fall 2014, is just as remarkable. The music video  made in secret in Iran, a country where female musicians are banned from singing solo in public  went viral in Afghanistan and somehow won over Sonita&apos;s family. Her mother is proud that her daughter could earn money for her music like a boy, Sonita says. She remains close to her mom and sends money home to her family whenever she can. Later that fall, the video came to the attention of Cori Shepherd Stern, a filmmaker and co-founder of a U.S. based nonprofit, Strongheart Group, which creates social action and advocacy campaigns. Stern contacted Loftin at Wasatch Academy, where they had sent students in the past, and Sonita was granted a scholarship. Loftin didn&apos;t consider admitting Sonita an academic risk, even though she had never attended formal school classes. In an interview in his office, Loftin underscores the educational value of the boarding school&apos;s diverse student body, where 40 countries are represented among the 330 students. The middle of nowhere can be the center of everything, as Loftin likes to say. Sonita&apos;s video and the upcoming documentary have sparked international news media interest, with stories aired by PRI and CNN, and posted on Bustle and London&apos;s Daily Mail website. "I&apos;ve arranged Skype interviews at all hours of the day and night," Moody says. That the filmmaker chose to get involved in Sonita&apos;s life reveals the intimate connections a new generation of contemporary filmmakers, female filmmakers in particular, are making with their subjects, says Debra Zimmerman, executive director of Women Make Movies, a nonprofit that supported the film through its production assistance program and is distributing it. That choice makes the movie more interesting. "It would be hard for anybody to turn Sonita down because she is so charismatic and charming," Zimmerman says, but doing so would have produced a different film. After its premiere at Amsterdam&apos;s International Documentary Film Festival in November, Sonita walked out of the audience rapping "Daughters for Sale." "No introduction," says Ghaem Maghami, whose film earned the festival&apos;s audience and youth jury awards. "We arranged it, but it looked like she just walked toward the stage and started singing. Seven hundred people were standing up and clapping, crying. They felt like they were seeing a miracle in front of their eyes." The miracle that is Sonita. &apos;Sonita&apos;s story is unfolding&apos; • The joke around Wasatch Academy is if Sonita has a choice about what to eat, she&apos;ll choose a cheeseburger. "Not every day," she says when asked, smiling because she likes pizza and the cafeteria&apos;s orange chicken, too, a sign of her adjustment to U.S. high-school life. She likes how American schools educate boys and girls together, but she declines to talk about an interracial dating survey that students have handed out. Whenever a photographer points a camera at her, she carefully adjusts her headscarf to cover her long dark braid out of respect for her family back home. On campus, Sonita giggles girlishly with a friend one minute, and the next, she&apos;s quietly checking in with the photographer who has stumbled while scrambling ahead on a snowy campus path to capture a shot. In her ESL class, Sonita chooses women&apos;s rights, in general, and child marriage, in specific, as the topic for a research project. Her teacher advises her to keep research notes in a Google document file so Sonita can stay in contact with school when traveling. Sonita says she feels safe at Wasatch Academy and likes that she can work on her campaign as part of her schoolwork. She hopes to graduate in 2017 and continue on to an American university, where she plans to study law and work for women&apos;s rights. "She&apos;s not just a beautiful face and eloquent speaker, she&apos;s also very smart," says Alyssa Wolf, her adviser, referring to Sonita&apos;s 100 percent score on her geometry final, which she took after missing classes during fall term due to international speaking engagements. 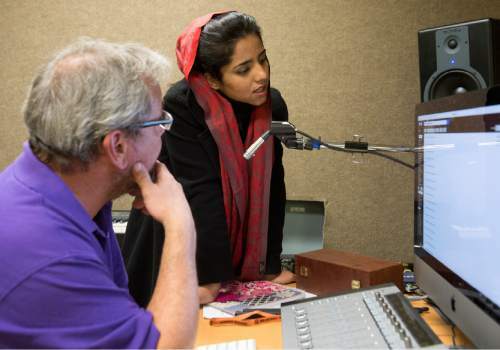 In the school&apos;s recording studio, Sonita focuses on pronunciation. She&apos;s not in the mood to rap this afternoon because she has not yet perfected the English translation of her lyrics. She can&apos;t say the word "dream," for example; that "r" is problematic, "because I&apos;m not American," she tells Moody, a bit petulantly. In 15 minutes, she&apos;s scheduled for a phone conversation with a volunteer who&apos;s working on her social-media feed. "My goal is to sing my song in English," she says. "It is a little bit hard for me." "Sonita&apos;s story is unfolding," Loftin says. "Rapping in English will bring her an even wider audience." 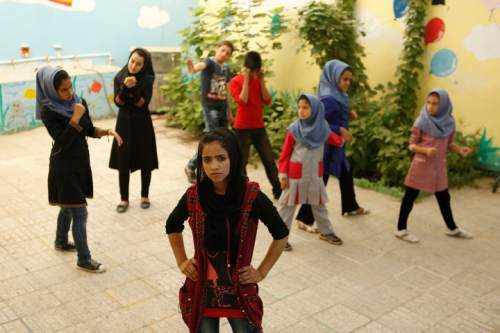 Iranian director Rokhsareh Ghaem Maghami&apos;s documentary follows Sonita Alizadah as the young Afghani woman dreams of becoming a rap singer and then secretly films a video that persuades her family to not sell her into an arranged marriage. The camera continues following Sonita as she earns international media attention and a scholarship to central Utah&apos;s Wasatch Academy. Also • Sonita Alidazeh will be performing at the Sundance Music Cafe on Tuesday, Jan. 26, at 4:30 p.m.
Trib Talk • Sonita Alizadeh and director Rokhsareh Ghaem Maghami join Jennifer Napier-Pearce to talk about the film, "Sonita," a selection in the Sundance Film Festival World Documentary competition. The discussion will be live videostreamed from the Utah Film Commission event in Park City. Watch Trib Talk Live on Monday, Jan. 25, at 3:45 p.m. on sltrib.com. Archived video will also be available online. The 2016 Sundance Film Festival. Tickets • $20 per screening. Box offices are in the Gateway Center, 136 Heber Ave., Park City, and in Trolley Square, 600 East and 600 South, Salt Lake City. Wait-list information • Register at ewaitlist.sundance.org and download the app to your smartphone or tablet; waitlist tickets are $20, cash only.